Traditional methods of "getting things done" just haven't worked for me. Time and time again I will find that 'to-do' at the end of my list that will inevitably get transferred over to the next one I create. I have often wondered why I do that. Is it the task itself that seems daunting? Or is it just not that important? But, if it wasn't that important how did it end up on my list in the first place? Well, I let go of the why and instead concentrated on what I knew. I finally understood that my relationship with those to-do's needed to change, but how? As I looked over the seemingly endless to-do list, I realized that all of my items could fit into a category. I began to formulate categories with a general idea in mind, areas in which I wanted to place more of my focus on but can't seem to find the time to do so. I hand selected the categories while keeping what I value and love about life in mind, as well as those hiding in between. I started with a pretty long list to say the least. Having a list of things I wanted to do within a week's time was far better than adhering to a list that didn't allow for deviations. It basically gives me a selection of to-do's that are parallel to my ever changing moods. I am still keeping a master list of items, but have included a weekly category sheet where I add accomplished tasks that get paired with the closest matching category. Since defining the categories is up to me, some things can go in to more than one. By mid-week, I surprised myself with how much I managed to get done. The categories are made up of keywords, all of which I believe are important for me to achieve. I came up with mine based on the things I love/like to do and more importantly the things I wanted to focus on doing more. 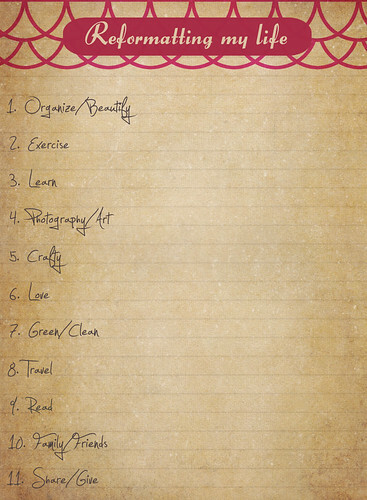 Having this list has forced me to find ways of incorporating those to-do's in a way that works best for me. As a result, I have crossed off a lot more items! I know what you're thinking, "This is as clear as mud!" or "What are these so called categories?!" I've got something better than lengthy explanations about what I picked and why. How about a visual aid! You know I love those. I'm sure you can see why my list contains certain items within, if you were to make a list, I bet you would come up with a few of the same selections. Of course this method won't work for everyone, but if you think it will work for you, it wouldn't hurt to give it a try. If anything, you may create some new habits that are actually good for you! ah girl, as you know my ONLY resolution is to LOVE this crazy life of mine. nice list, i love the way art and exercise make me feel. You have put a lot of thought into this list and the directions yo have listed are close to your heart. I think you will have no problem advancing in all areas this year. I am looking forward to seeing your grow to amazing heights. Really great list!!! I like this idea! 3 & 4 are on my list of to dos - they never get done! i have a similar list!! I've already started to slip on some things--like trying to meditate--that's been on my list for years! Resolutions are so hard, aren't they? You have pretty handwriting. Nice list! Good luck! I LOVE this idea. I will get to work on a list. I've started carrying notebooks in my purse so I can always have one handy for inspiration, notes and reminders. Thats the one way I've inproved in 2009. What a wonderful idea! I'm forever making to-do's and carrying things over . . . for sometimes months at a time. Maybe those that get dragged on and on, are just not challenging enough? I dunno . . . I love this concept! This year, I also re-did my thinking about goals and resolutions. And I'm actually getting A LOT more accomplished. The thing that works for me is picturing two things that I want to get done on the following day (besides my normal mundane tasks) . . . writing them down on my "list" and then thinking about them as I go to sleep. I wake up the next morning with FOCUS and a plan in mind. So far it's working for me. I love lists and I am always making them, even ways to improve my life! My list would look a lot like yours! Great WW! Well jessica i'm in a place in my life where i don't have to make list's all that need's to get done get done? why because at my age i've thrown out the dross to do only what need's to be done .we put so much pressure on ourself's.Put God First. Loved one's second.the home,community, work,leisure,Sad to say to day's society,it's self self self.must have.bye the way over to N.C this coming sept.for three weeks, and surounding state,s.will let you know more nearer the time. Love to you Cody.glad Cody going green but don't believe in globle warming. Oh I cannot live without lists... I have them everywhere, LOL! I can't do anything without lists! nice list, I love the header of the note :P that really got me thinking. i think my list would have many of the same categories as yours but i'm not good with list. i admire your plan and hope you continue to cross off items - meeting all your goals this year. yup, that would be my list, right there! Great list! I really like the idea of "reformatting" my life instead of thinking in terms of "to do's." Thanks for a very good idea, WW. I LOVE your list. I could actually print and it and use it myself because it's everything I want to do and more. Seriously. I usually keep a date book with me and write future plans on it. I also keep my Memory Bank Book (by Jacqueline Mott Brown) on me at all times, so whenever anything hits me, I jot it down before I forget. Great idea! I'm so bad with resolutions too. This sounds like a good alternative to actually sticking to your plan! Good luck! it's all about focus, isn't it? I use lists and notes and resolution-making to shine a light on what I want and more importantly what I need. I love your idea of reformatting. Good idea. Mine usually just has one on it- be better in some way today than yesterday. wow is that your handwriting? i love it! and i like the things on the list too. That picture looks so fragile and the blues are pretty. I have a bad habit of forgetting from one moment to another.